Melt the butter in a medium pot. Add the chopped apples and sugar. Move constantly to allow the sugar to melt and the apples to soften, about 3-5 minutes. Add the lychee, cinnamon, ginger and lemon juice. Cook for a few more minutes. Empty this mixture into a 9x9 inch baking dish and set aside. Mix the flour, oatmeal and sugar in a bowl. Remove the 3 ounces of butter from the fridge and use a sharp knife to cut them into very small pieces. Pour into the flour and sugar mixture; use two forks to mix without letting the butter melt. Pour the crumble mixture onto the apples and lychee. Bake for 25 minutes. Remove from the oven. Let sit for 10 minutes and serve with cherry ice cream. It’s important that the butter for the crumble is very cold. I stick it in the freezer the moment I begin this recipe. This way it’s cold and firm when I need it. Lychee is an exotic eastern fruit that is meaty and sweet with a soft flavor. It’s uncommon to find them in their natural state in the supermarket, you’ll more than likely find them canned in syrup. Lychee combines very well with apples and when combined with a bit of acidity, you create an exquisite dessert. 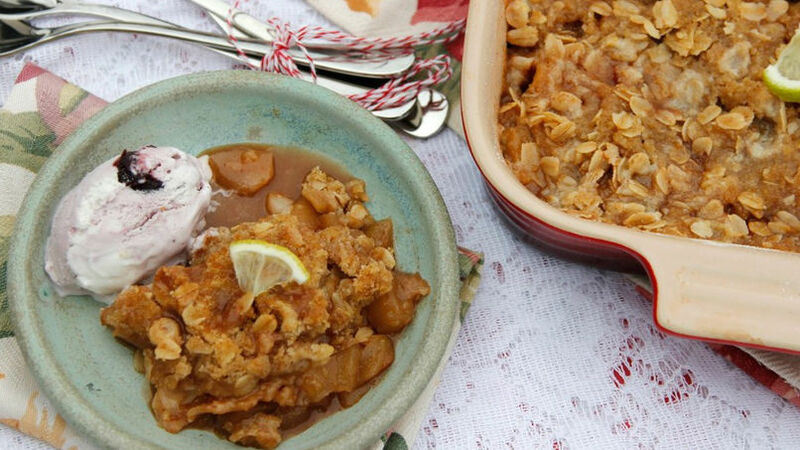 The crumble I bring you today is an extraordinary combination of flavors. The soft apples and lychee pair beautifully with ginger, cinnamon and lemon juice. This sweet and sour dessert can be prepared in less than an hour. Serve warm with a ball of cherry ice cream. Enjoy!